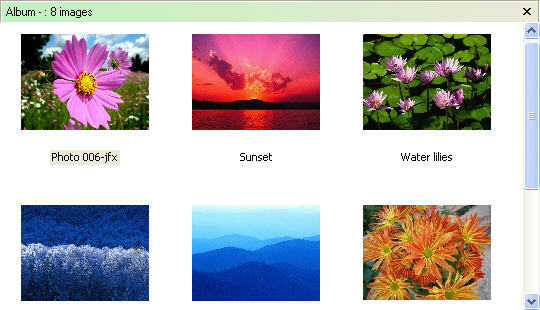 In the album pane you can collect up to 998 images from multiple folders in one place. Each album has a set of links to the images it contains, which you can re-arrange using our unique AccuDrop technology. The album pane's title bar shows information about the album, including whether or not it has been saved. If you use a chronological filing system, you can assemble a set of images from various folders that have a common theme, select the best ones, lay them out in any order you like, and view them in that order as a slide show. Many photo-sharing sites have upload tools that are either cumbersome or don't work offline at all, so Visual Album can export a copy of an album's images to a single folder, and optionally resize them in the process. Having all of your images ready in a single folder makes it much easier to upload photos to these sites. Once you've uploaded the exported images you can delete them, and delete the album. To get an idea of what an album might look like as a web page, you can experiment with different layouts by changing the height or the width of the album pane.